Rather than discuss the entire Trek movie, I’ll just mention a few brief thoughts. Most of the characters are different in some ways in the movie, compared to their counterparts in the series. The reasons behind these differences is apparent in most cases. The differences between the versions of Spock are easy to understand for example. Spock’s father Sarek in the series was very big on ordering Spock around and telling him he should act as he thinks a Vulcan should act (not show his emotions and do his best to not even feel them), and do what he thinks a Vulcan should do (work at the Vulcan Science Academy). 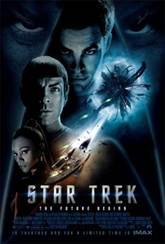 However, in the movie Sarek is very supportive of Spock and tells him he should choose his own path. While this explains Spock’s different behaviour quite well, the explanation is at its core a ‘turtles all the way down’ explanation, because we have no explanation at all for why Sarek is so different. Another notable point for me in the movie was them showing numerous shuttlecraft on the Enterprise on its maiden voyage. Why this was notable to me was that in the series episode “The Enemy Within,” Sulu et al were trapped on the planet Alfa 177, because the transporter is duplicating everything it transports into good and evil versions. (This variation on the “Jekyll and Hyde” idea has been parodied, in such shows as Red Dwarf and Ren and Stimpy.) I wondered when I first saw it why they didn’t pick them up with a shuttlecraft. Some have post hoc claimed that the Enterprise didn’t have shuttles during that early episode. Having shuttles on the Enterprise’s first mission in the movie is suggestive that they didn’t pick up Sulu... because they didn’t like him. But then again, if they really didn’t like Sulu, they might have beamed him down some spare blankets, just to see what the evil versions of the blankets would have done to him. While many people claim that it’s the characters that make a story, I confess it was the sets of the Enterprise that impressed me the most in this movie. I wanted to go on the ship and play, more than I wanted to talk to any of the characters there. I wanted to do both of these about equally with the original TV-series. My biggest complaint about the movie is the same complaint I have for any story featuring time travel. Time travel in a story is like a magic wand. The limitations in such a story seem contrived, because just about any problem could be fixed with a magic wand or a time machine. Over all, the Trek movie felt like Star Trek and it felt like science fiction, so I was happy.